Is It Time to Rethink Hitter’s Counts? Hitters have always lived by the idea that they will try and work the count in their favor to not only get closer to a walk, but to force the pitcher to be more predictable. Limit the pitcher down to just throwing you a fastball, and give yourself a better chance at guessing correctly. Pitchers do not want to walk people and will throw their fastball much more predictably as they fall down in the count. Take Clayton Kershaw, for example. As Jeff Sullivan pointed out in an excellent piece, Kershaw is pretty strong against using his curveball in hitter’s counts. A pitch he throws roughly 17 percent of the time has been almost nonexistent in hitter’s counts. For any hitter, getting to a friendly count against Kershaw means he does not have to worry about seeing the curveball. Take a look at how he has used all of his pitches, by count, in 2017. Get yourself in a hitter-friendly count and sit fastball. Of course, it is easier said than done to hit Kershaw, but it has led me to wonder whether it is right to keep throwing so many fastballs in counts where hitters are anticipating fastballs. To start, I pulled the results for off-speed and fastball usage in hitter’s counts for all pitchers in 2017 (min 50 off-speed and fastballs each in hitter’s counts). Just to try and get a sense as to whether there was any relation, I first took a look at off-speed usage in hitter’s counts vs xwOBA. Nothing to really find here; a lot of randomness. What about fastball usage in hitter’s counts? There is a small relationship here, but not too much to glean from this, even from the guys who have bigger (faster) fastballs. But pay attention to the y-axis for both plots: the fastball group is centered higher than the off-speed group. It is not something small, either. Much of the concern here, I am sure, revolves around the basis that pitchers throw fastballs in these counts because there is a significantly higher chance of throwing a strike with a fastball versus an off-speed pitch. Well, that simply is not the case. We see only a six percent difference here. There is a lot that goes into guys throwing off-speed pitches for strikes, but this is something more negligible than I thought. Normally, you would think some players would not have this much control over off-speed pitches, but they are big-league pitchers. So, we have pitchers who can throw off-speed pitches in the zone nearly as often as they do fastballs when hitters are ahead in the count. How have hitters fared against those pitches in the zone? This is from the same two groupings of pitchers (min 50 off-speed and fastballs in hitter’s counts), so there is some overlap for some players. But, I hope you can see the off-speed grouping is centered a little more left than the fastball groupings. For these players, the average off-speed exit velocity was roughly two MPH lower than the average fastball exit velocity (82.4 vs 85 MPH). The league average sees a similar split as well (88.1 vs 90.7 MPH). To put this velocity gap in perspective, among the 387 pitchers who threw at least 750 pitches in 2017, the standard deviation of exit velocity was 1.56 mph. One thing I have neglected so far is pitch location. Oftentimes, it’s hard enough for hitters to adjust and hit a pitch they weren’t expecting so I could be looking too closely at stuff. I had mentioned in my previous post that the exit velocities for offspeed pitches in these counts were lower than fastballs (roughly 2 MPH slower). 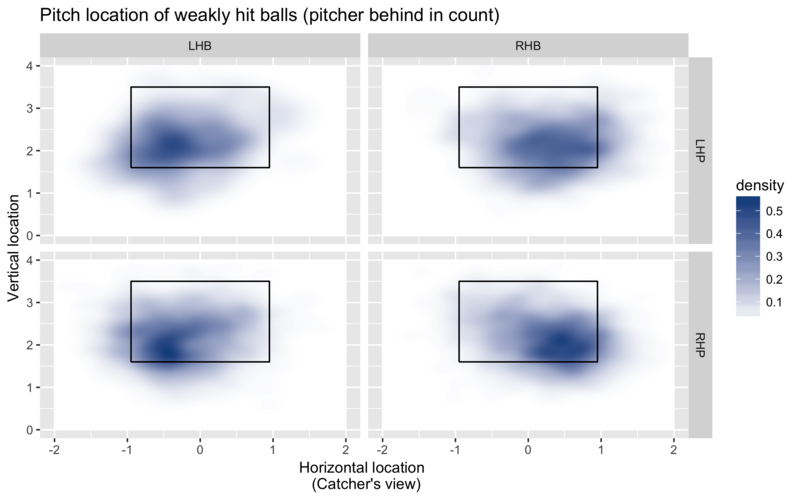 To get a sense as to how pitchers have done this, it’s important to take a look as to where they’ve located these pitches. I started by sorting for batted balls hit 85 mph or less in hitter’s counts. It’s important to note that both of the concentrated groupings are located in the zone. 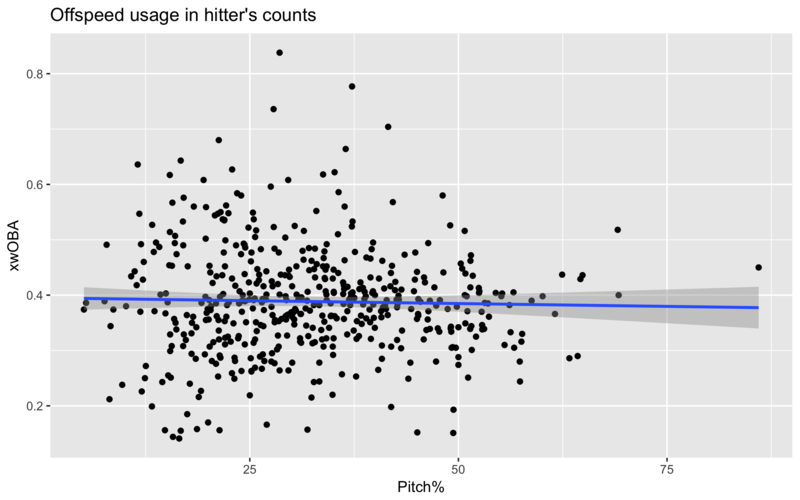 Most importantly, but not so surprisingly, the majority of these pitches come on the lower, outside part of the plate. However, to generate weak contact, you’d expect pitchers to be more fine in their location. This is still pretty dependent on fitting pitches on the lower third, but it’s getting weak contact on pitches in the zone. The pitch groupings themselves are something sort of hazy or hard to really discern. 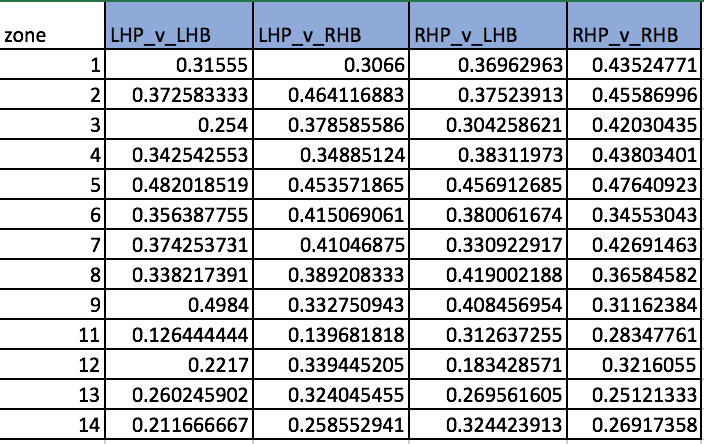 To get a more definite look as to what damage is being done, it’s best to take a look at xwOBA by zone for the different pitcher-vs.-hitter matchup combos. 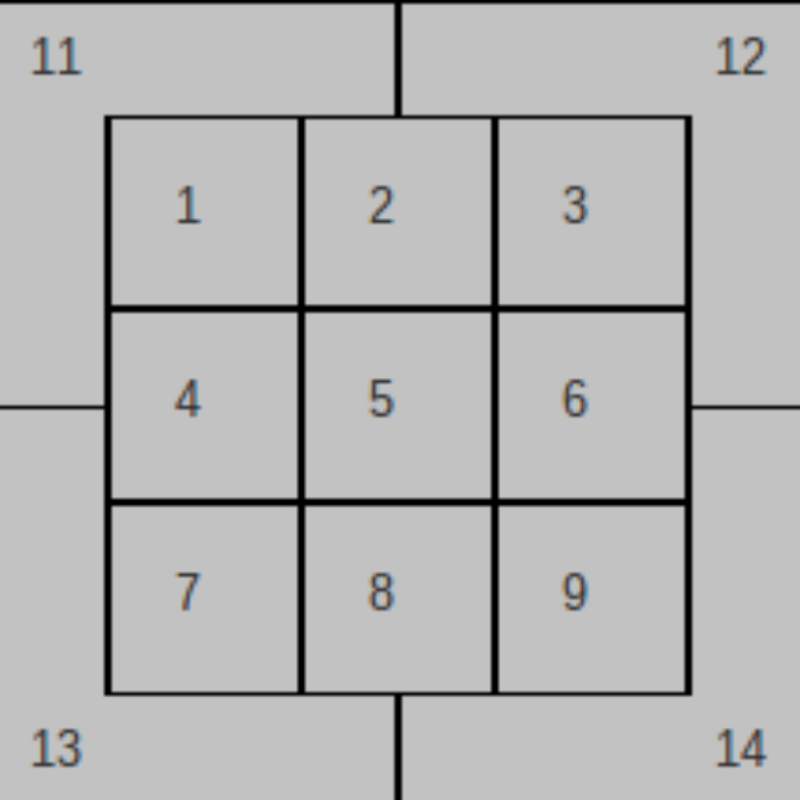 I’ll be talking about these different pitch zones as they are shown in PitchF/x and Baseball Savant data. I apologize for not being able to present this information in a more palatable fashion but I hope you can see that it’s more than just throwing offspeed low and away. There’s a lot to digest in this. 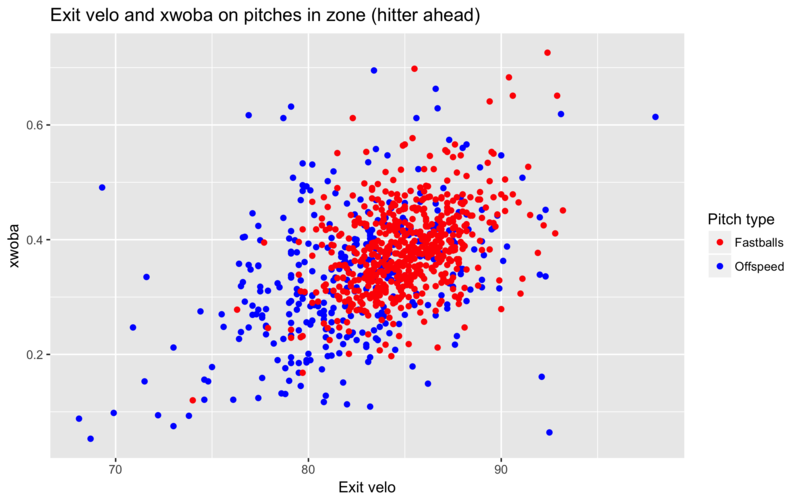 Depending on pitcher handedness, there are 50 and 80-point swings in xwOBA for pitches thrown in the same location. There are some issues with a lack of data, but only for the corner zones. There are a few caveats to all of this. There was nothing direct about throwing more off-speed pitches in hitter’s counts that led to better results; there is a smaller sample of off-speed pitches thrown versus fastballs thrown in hitter’s counts, and sequencing is always an issue that is hard to build in. And maybe it is not fair to consider all counts where the hitter is ahead. 1-0 certainly is not the same as 3-0, but enough of the general convention still seems to be in place today. 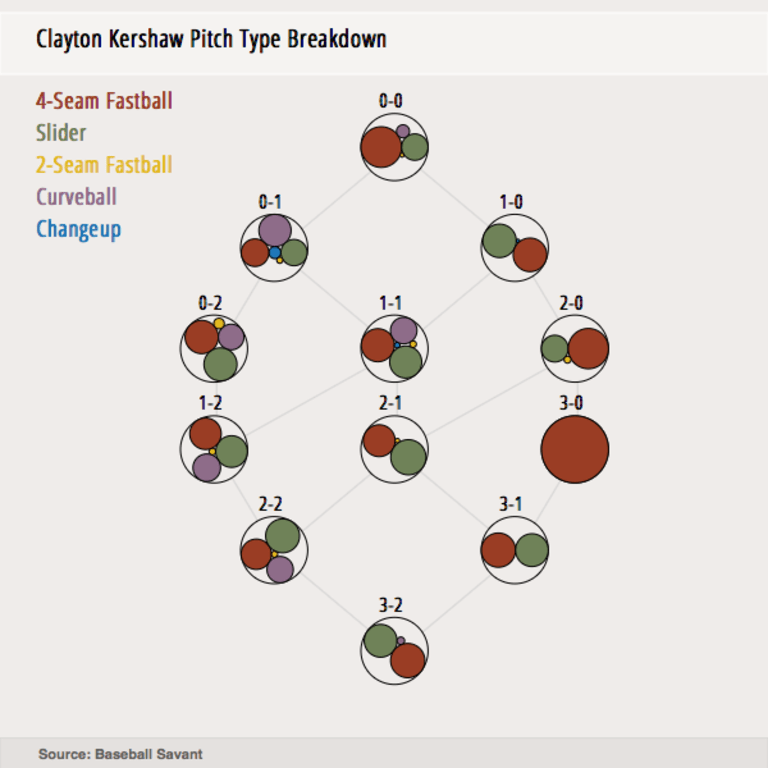 Even a pitcher like Clayton Kershaw becomes more predictable and narrows his arsenal after falling down 1-0. But it is time for pitchers to expand their arsenals and use their off-speed pitches more often in hitter’s counts. The league as a whole is throwing offspeed pitches 29% of the time when down in the count, and that number has been gradually increasing season after season. Pitchers can certainly throw their off-speed pitches in the zone nearly as often as they can their fastballs, and to better results as well. Much of the hitter’s advantage when the count is in his favor is that he has a better idea as to what pitch is coming. Given the skill of MLB pitchers, it is an advantage that very well could be taken away to favorable results. Jeff Samardzija is incredibly frustrating at times. For the first few months of 2016, Giants fans saw a pitcher who would more than earn the five-year, $90-million contract he had signed in the offseason. In April and May, Samardzija posted FIPs of 3.67 and 2.45, as well 11.9% and 19.1% K-BB rates. Those numbers are pretty worthwhile considering Samardzija has forged himself into a workhorse, averaging over 200 IP over the past four seasons. The Giants would be plenty happy with that for a full season. All seemed well in Giants land. The free agents were proving their worth, Madison Bumgarner’s greatest concern was with his own hitting (that may always be true), and Buster Posey was healthy. The even-year sorcery seemed to be working. June and July came around, though, and Samardzija saw himself regress into what looked like the 2015 version of himself. In June and July Samardzija posted FIPs of 7.09 and 5.06. Samardzija was giving up homers at an alarming pace and he was desperately struggling to strike people out. Oddly enough, Samardzija was drastically altering his pitch mix in the middle of the year. That looks experimental more than anything else. 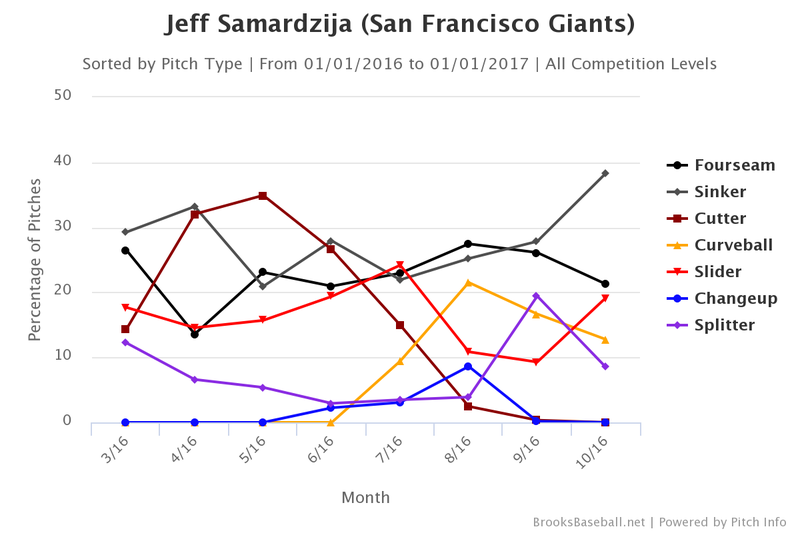 For Samardzija to maintain his level of performance even in his good months is pretty solid given such drastic changes in pitch mixes. For reference, here is Samardzija’s FIP throughout the course of last year. You can see the success I mentioned earlier before June and July came around, but Samardzija also set out on a strong end to the season, posting a 3.67 FIP in August and a 2.38 FIP in September/October to somehow bring his FIP below the league average. That final stretch also saw Samardzija posting a 21.8 K-BB% as well, maintaining a similar walk rate he posted all season while striking out 28.6% of batters. Staring through the bevy of pitches Samardzija featured through the season, you can see where he was getting to in the end. He almost entirely ditched his cutter and found a balance between his four-seam and two-seam fastballs. The curveball usage held steady, the slider usage went down, and the splitter continued to emerge as a favorite. The splitter usage has appeared to come about as Samardzija’s neutralizer towards lefties, and it has worked well. Lefties have given Samardzija trouble for his whole career and the near-60-point difference in wOBA versus lefties last year is fairly alarming (.331 vs .276), so an offspeed pitch that moves away from lefties is crucial. That splitter itself is fairly similar in movement to Masahiro Tanaka’s. 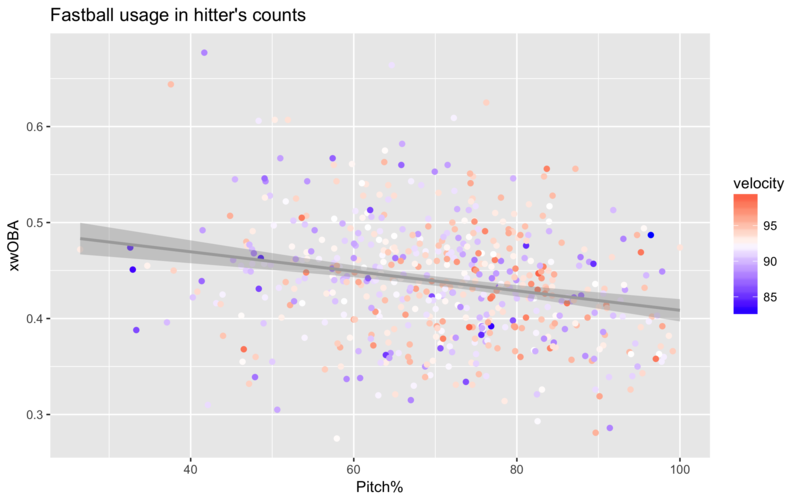 Should Samardzija use the splitter versus lefties as much as Tanaka does (nearly 30%!) and locate it as Tanaka does (low and away from lefties), it should be effective, given his SwStr% with the pitch throughout his career (19.5%). Here is Samardzija in his last tune-up before the season. In those final two months last year, Samardzija was able to continually do better against righties while limiting lefties to a somewhat manageable .410 SLG. Should Samardzija maintain a similar pitch mix, he would look more like his four-win 2014 campaign. Pitching isn’t that simple, but he’s making his way back to something that had worked quite well for him in the past. The 2016 Giants season became all about the monstrous second-half collapse, but hidden in there was a bit of a Jeff Samardzija resurgence. In 2017, Samardzija will almost assuredly be worth his salary in durability alone. But if he can continue to utilize his splitter as he had toward the end of 2016, I would expect him to outperform his projections (Steamer 3.84 ERA 3.78 FIP 4.09 xFIP) and deliver a performance more in line with his 2014 season. The Giants rotation already runs deep, but they could be looking at one of the most durable and effective groups of front-line starters in the game. What to Do With Justin Upton? Justin Upton is still only 29. It can be easy to forget about a guy who hasn’t come close to a peak that was over five years ago, but few can maintain the level of excellence that was Justin Upton’s 2011 season. The hype built from a year like that is huge. The 2005 No. 1 overall pick posting a six-win season at 23 with 31 HR and 21 steals. It’s pretty exciting. Guys who have enough power to do this are generally pretty talented. Fresh off signing a six-year, $132-million contract, Upton posted a 77 wRC+ along with a .235/.289/.381 slash line in the first half of the season. He struck out in nearly a third of his plate appearances and held a walk rate below his career average. Most importantly, though, when the Tigers paid Upton big money, they paid him to hit dingers and knock the ball around the yard for extra bases. So someone like him hitting nine homers with a .146 ISO over 350 plate appearances is worrisome. Yet at the end of the season, Upton ended up with an overall wRC+ of 105, and an ISO of .219. For qualifying batters, Upton held the crown for the highest second-half ISO increase (.172) while having the fourth-highest ISO of the second half (.318). Meanwhile, he held a second-half wRC+ of 142. Now, I do understand that he had 86 fewer plate appearances in the second half (356 vs. 270), so it is reasonable to take the ISO and wRC+ increases with a grain of salt. But Upton slugged 22 homers in 270 trips, good for the fourth-most in the second half, behind walking flame Brian Dozier, Khris “I hit dingers through the marine layer” Davis, and Jedd Gyorko (??!!??!). I don’t know if people expect Upton to start breaking down or expected him to start breaking down but he still continues to crush the ball. For what it’s worth, on average he hits the ball as hard as Paul Goldschmidt (92.3 MPH) and barrels up balls at the same rate as Kris Bryant (7.7% Brls/PA) for an expected ISO of .235 (thanks to Billy Stampfl’s eISO equation). Just for fun, he set his max exit velocity at 114 MPH on his last homer of the year. Upton is projected by Steamer for a .346 wOBA and 116 wRC+ this season, good for a 2.1 WAR. Given his ability to crush baseballs and his age, I still think Upton has a good chance of surpassing his projections. He’s showed that he has big power, but his first half is weighing his projections down. The Tigers’ plans going forward are banking on whether or not they can put themselves in a playoff position during the first half before they think about any sort of fire sale. They’re projected to be in the thick of the wild-card race, so they may run a repeat of 2016 and push through to see how close they come. But they can’t continue this way to pay an old core through the next three to four years. In cases like Miguel Cabrera and Victor Martinez, they don’t have much choice but to eat those contracts until they run up. If things don’t go as planned, the first thing they can do is to ship off J.D. Martinez as a rental and start to rebuild a mostly barren farm system. Martinez is due to become a free agent at the end of the year and there is little chance that the Tigers will offer him the lucrative contract extension that he most likely wants. Ian Kinsler could go next to whomever may need a second baseman and is willing to accept his age. If they really wanted, the Tigers could also see if they could send off Justin Verlander (given that they eat a sizable chunk of his contract). But the best move for the Tigers could come in the form of trading a resurgent Justin Upton, who can prove that his second-half numbers were no fluke and that the 29-year-old can maintain solid power, as he has throughout his career. It’s tough to find a home for Upton, but the Yankees might be the ones willing to take on his contract, as they’ll be done with CC Sabathia’s monster contract at the end of this year, and Brett Gardner’s contract in 2018. A team like the Yankees might prefer to take Upton and his $22-million AAV rather than test the market for sluggers like J.D. Martinez (also 29) and have to possibly pay more. The Yankees might be willing to take on some of the money and go with a safer outfield bet in Upton rather than having to wait for Aaron Judge or Clint Frazier to become steady contributors. This Yankees team looks like they’re trying to win now, given that they just signed Matt Holliday and Aroldis Chapman, so they might be willing to part with a few prospects at the deadline. Left field is a weak position right now, and a contender could be looking for a power bat to provide 2-3 wins a year. Should Justin Upton carry his second-half resurgence into 2017, his bat could be too good to pass up, and the Tigers could move his contract and get something going towards a rebuild.